SOLD Zeus and Artemis Pendant. 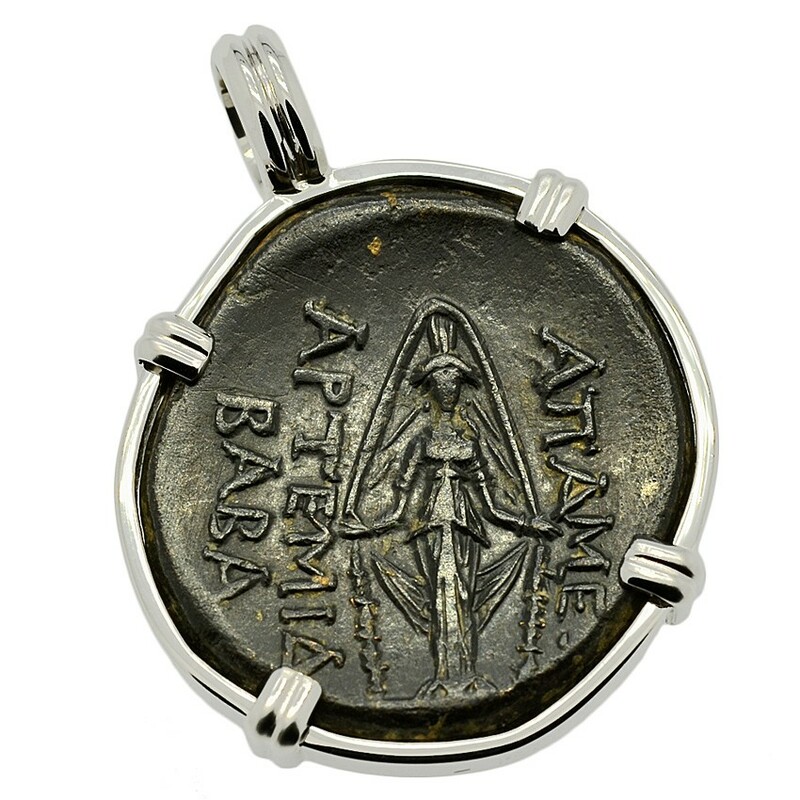 Please Explore Our Greek Pendants For Similar Items. This coin was minted in the great ancient city of Apamea, which was located in present day western Turkey along the river Maeander, in the Hellenistic region of Phrygia. Stories of the heroic age of Greek mythology tell of the Phrygian King Midas, who turned whatever he touched to gold and according to Homer's Iliad, the Phrygians participated in the Trojan War as close allies of the Trojans. In 333 BC, Alexander the Great liberated this region from the Persians and by 188 BC, the southern remnant of Phrygia came under the control of the Attalid Dynasty of Pergamon. The Attalids were loyal supporters of Rome, ruling with intelligence and generosity and the Greek cities in this Kingdom maintained a level of independence. When the ruler Attalus III died without an heir in 133 BC, he bequeathed the whole of Pergamon to Rome in order to prevent a civil war. 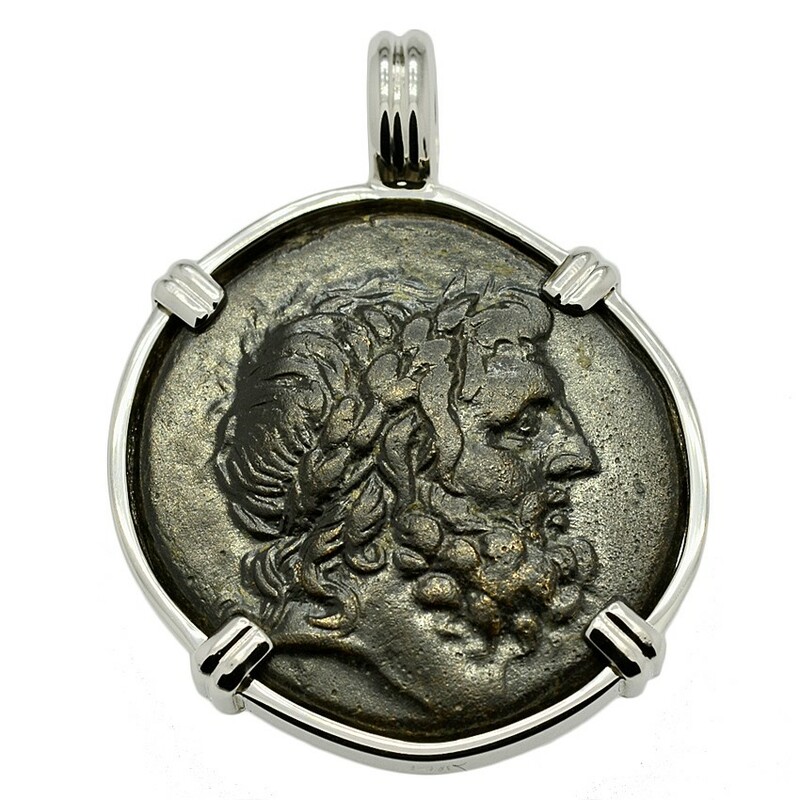 The obverse of this coin shows the head of Zeus, the most powerful Greek god crowned with oak leaves. In Greek mythology, Zeus is the King of the gods, the ruler of Mount Olympus and the god of the sky and thunder. His symbols are the thunderbolt, eagle, bull and oak. 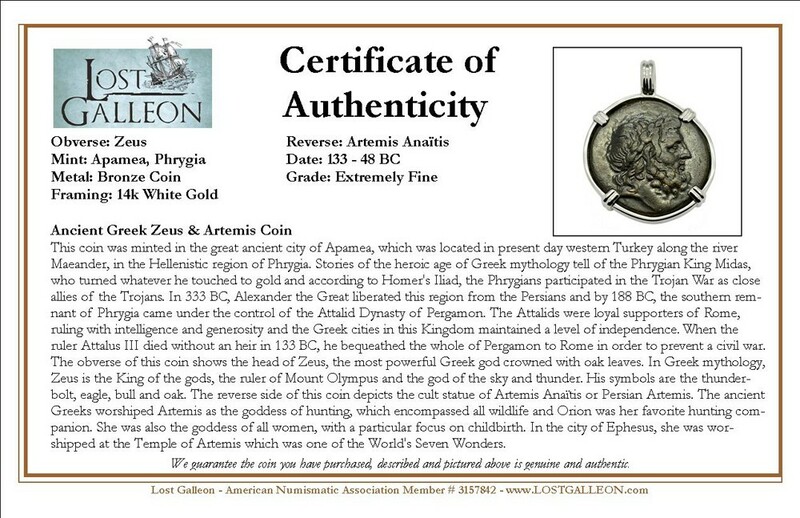 The reverse side of this coin depicts the cult statue of Artemis Anaïtis or Persian Artemis. The ancient Greeks worshiped Artemis as the goddess of hunting, which encompassed all wildlife and Orion was her favorite hunting companion. She was also the goddess of all women, with a particular focus on childbirth. In the city of Ephesus, she was worshipped at the Temple of Artemis which was one of the World's Seven Wonders.